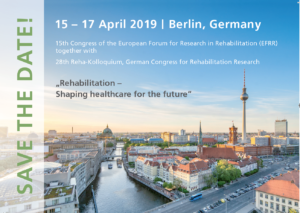 The European Forum for research in Rehabilitation (EFRR) is the major multidisciplinary rehabilitation research forum in Europe. Originally formed in 1983, it has members from all parts of Europe. The purpose of EFRR is to advance research and education in biopsychosocial aspects of rehabilitation. The outcomes of such research are implemented and disseminated with the aim of improving both the provision of social, vocational, health-care and rehabilitation services and the standards of practice in these services, for the benefit of people with disabilities. The Council of EFRR kindly invites you to participate at the 15th Congress of EFRR!